In 1989 the creative freedom Kenner exerted pretty much brought a line of figures that had little to nothing to do with The Real Ghostbusters. They’re not hero figures nor are they even ghost figures. They’re literally Monsters. Kenner in no certain terms made sure we knew what our parents were buying. Classic, perhaps vintage horror characters based on either literature, film, or both. I feel like I would remember if I had any of the six monsters in childhood. I was around 12 then and the days of my parents buying me figures were waining. In adulthood I’m trying to use logic to understand why Kenner produced these in The Real Ghostbusters line. Maybe with the license some highly respected Kenner employee wanted to make them. I can imagine children having there The Real Ghostbusters hero figures battle one or more of the Monsters. What could the end result be? You can’t really use the Proton Packs and they can’t be contained. The fun in each of these monster figures are their actions, what they can do to scareand frighten say Fright Features The Real Ghostbusters. 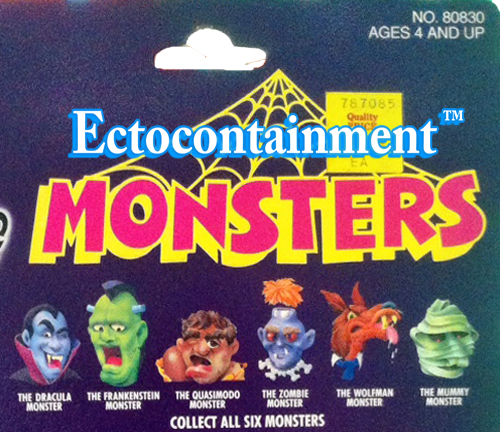 With this Ectocontainment™ Feature I’ll be taking a look at each Monster, beginning with The Dracula Monster.